We're so excited to share our review of DANCE OF THE BONES by J.A. 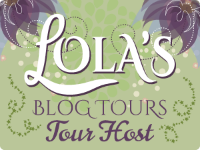 Jance for TLC Book Tours! J. P. Beaumont and Brandon Walker, two of New York Times bestselling author J. A. Jance's most acclaimed series characters, join forces for the first time in one of the most suspenseful works of her career. Now, more than four decades later, the retired Walker is called in when TLC—The Last Chance, a group of retired cops, criminalists, medical examiners, and district attorneys who devote their time and experience to solving stone-cold homicide cases—looks into the killing. Lassiter can get out of jail now for time served if he'll plead guilty to a lesser charge, but he refuses to cop to a crime he didn't commit. Lassiter's daughter, Amanda Wasser, wants Brandon and TLC to find Amos's "real" killer and clear her father's name. Brandon Walker's search to find the truth about Amos's killer eventually leads sixteen hundred miles north to Seattle, to an unsolved murder that could be connected to the case. Thanks to a mutual friend, Brandon gets in touch with crack investigator J. P. Beaumont. With the Special Homicide Investigation Team disbanded and his wife away at a conference, the retired Beau has plenty of free time to help, even though he's skeptical about Lassiter's claims of innocence. J. P. Beaumont and Brandon Walker's meeting proves all too crucial, for soon these seasoned detectives must pool their personal and professional expertise when someone close to Brandon falls into the hands of a cold-blooded killer involved in a recent multiple homicide—who may also hold the key to the cold case. Moving between the hot, empty desert of Pima County and Seattle's rainy cityscape, Dance of the Bones combines Native American lore and modern suspense, and brings together two law enforcement legends in an exciting thriller that adds intriguing depth to two of J. A. Jance's beloved leading characters. Cove Member Robin Reviews—DANCE OF THE BONES! Thank you Reading Cove for providing me a copy of this book. This is my honest review of the book. J.P. Beaumont and Brandon Walker are united for the first time to investigate a cold case in Dance of the Bones. Many years ago, Brandon Walker, was working the case of Amos Warren, a prospector, who was murdered while looking for treasures in the desert. Walker arrested John Lassiter for the crime and he was found guilty and sent to prison. Now Lassiter is refusing to accept a deal that would make him a free man and he is asking for Brandon’s help to find the real killer and clear his name. In Seattle, J.P. Beaumont finds himself with plenty of free time when the Special Homicide Investigation Team is unexpectedly disbanded. When Beau finds out that there are links between the murder of Amos Warren and an unsolved case in Seattle he reaches out to J.P. for assistance. The cold case becomes active again when two young boys who live on the Indian reservation go missing, and one of the boys has a close relationship with Brandon and his wife. This case comes at a time when both Walker and Beaumont are struggling with the challenges of having time on their hands but the clock is ticking and the lives of two young people and a potentially innocent man that has been wrongly accused of murder are dependent on the entwined cases being solved. It is refreshing to pick up a novel that unites two of J.A. Jance’s beloved characters. Fans of the Beaumont and Ladd/Walker series will enjoy this whodunit. Dance of the Bones leverages aspects of both series but seems to be lacking the “secret sauce” that makes Jance’s books so addictive. The book includes quite a bit of American Indian folklore that is very interesting but is not well integrated with the plotline and causes the book to feel somewhat disjointed and hard to follow. The pace of the book is quite slow at the beginning and the author seems to spend too much time on the subplots rather than the main whodunit and the relationship that is forged between the two main characters. 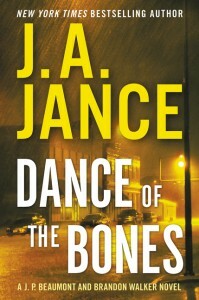 Although Dance of the Bones is not one of Jance’s best books, it is still a good read and an interesting whodunit that comes together nicely at the end. J. 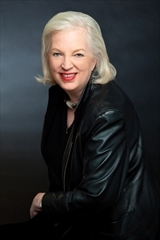 A. Jance is the New York Times bestselling author of the J. P. Beaumont series, the Joanna Brady series, the Ali Reynolds series, and five interrelated thrillers about the Walker family, as well as a volume of poetry. Born in South Dakota and brought up in Bisbee, Arizona, Jance lives with her husband in Seattle, Washington, and Tucson, Arizona. Find out more about Jance at her website, and connect with her on Facebook and Twitter.